In the Newspaper theme, the theme calls wp_nav_menu twice with the same theme_location parameter. Because the mobile menu is called first, and you can only have one UberMenu per page, UberMenu is applied only to the mobile menu, and the primary menu remains unchanged. With current versions of UberMenu, you should be able to set the Theme Location Instance to 2 (under UberMenu Control Panel > Advanced Settings ) to resolve Newspaper’s use of the same theme location parameter. Now, Newspaper comes with a child theme, so if you wanted you could very easily adjust the header to remove the mobile menu and just use UberMenu. However, I assume you want to use Newspaper’s nice sidebar menu, in which case the simplest solution is to just change out the menu theme locations. In other words, we’re going to separate the two menu so that UberMenu will only affect the header menu but not the mobile menu. 1. If you haven’t already, install and activate the child theme included with Newspaper. This will register a new theme location called “Mobile Menu”, which will appear in your Menus Panel. Here is the full menu_mobile.php file which you can use in your child theme. 6. Go back to your Manage Locations Panel, under Appearance > Menus > Manage Locations (tab), and assign your main menu to the Mobile Menu theme location. 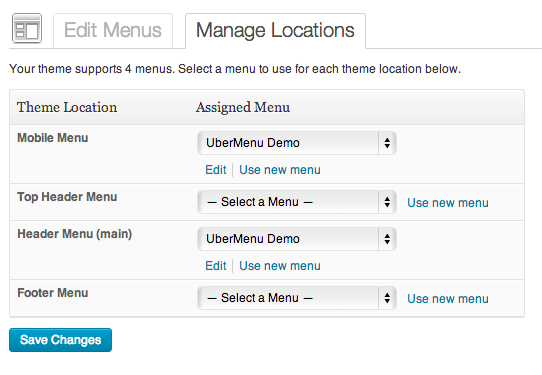 You will now have UberMenu as your main header menu, and the theme’s menu as the mobile menu.